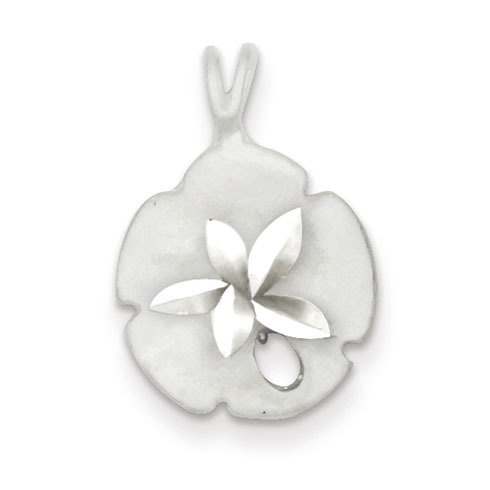 Diamond-cut, satin finish sand dollar charm is made of sterling silver. Item measures 5/8 inch tall by 9/16 inch wide without bail. Weight: 1.25 grams. This is an absolutely stunning Sand Dollar. The diamond cut sparkles when the light hits it. The only thing I wasn't happy about was the hole in the sand dollar but I have grown to ignore it. No one has ever mentioned it to me, just how lovely it is. I just wish I knew how to keep it from tarnishing so easily. Otherwise I love it! !